In a previous article, I outlined the role of the vagus nerve in responding to infection/damage signals by producing signals that inhibit inflammation. In a recent article (ref. below), the role of the vagus nerve in gut inflammation was examined using real-time biophotonic labeling. Basically that means that a video camera sensitive to infrared can be used to detect infrared dyes produced when NFkB is activated -- the camera is able to visualize regions of inflammation in living mice. Using this technique, researchers were able to demonstrate that cutting the vagus nerve produced heightened inflammation in gut treated with an irritant. The vagus nerve appears to stimulate regulatory T cells that lower the activity of inflammatory cells. The studies were performed in a mouse line constructed to express an infrared fluorescent protein in cells in which the inflammation transcription factor, NFkB, is activated. Mice of this strain were prepared with and without the vagus nerve intact leading to the intestines. The mice were then exposed to sodium dextran sulfate (DSS) to simulate inflammatory bowel disease symptoms. Mice with intact vagus nerves exhibited much less inflammation in their gut than those without vagus innervation. The cut vagus experiments demonstrated that the vagus nerve was responsible for suppressing inflammation. Further experiments were performed to determine if the inflammatory and anti-inflammatory reactions could be transferred to other mice by transferring cells from the treated mice. Transfer experiments showed that inflammatory T cells (CD4+, CD25-) from cut vagus, DSS mice would cause bowel inflammation in other mice, but that did not happen with the same type of cells from mice with intact vagus nerves. 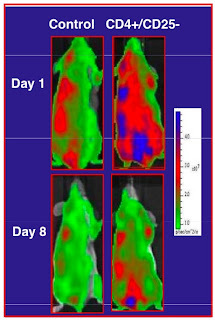 Further tests showed that either cutting the vagus or adding inflammatory T cells from a mouse with a cut vagus, reduced the population of regulatory T cells (CD4+, CD25+) in control mice treated with DSS. So, without the vagus stimulation, the regulatory T cell population declined in the presence of inflammatory signals. In many inflammatory diseases, e.g. celiac, Crohn’s disease, rosacea, there appears to be a deficiency of regulatory T cells. In the absence regulatory T cells, signals from vagus nerves will no longer produce anti-inflammatory suppression. In fact the same nerve signals may become inflammatory. This would explain why rosaceans will become inflamed by hot or cold stimulation that would normally lead to anti-inflammatory stimulation of regulatory T cells. Similarly, capsaicin, castor oil and menthol, which normally produce an anti-inflammatory response, produce inflammation in rosaceans. Dr Ayers, thanks for this fascinating post. Many wild associations pop up, but I don't know if they are appropriate. Excuse me if they are not. A couple of years ago Canadian researchers basically cured type 1 diabetic mice by injecting capsaicin into their pancreases. By temporary knocking out their pancreatic nerves, the supposedly dead beta cells started regenerating and kept going, if I recall it right. HPA-axis dysfunction - too much sympathetic and too little parasympathetic activity - is strongly associated with a plethora of (inflammatory?) maladies, such as metabolic syndrome and coronary heart disease. This seems to be a causal relationship. One of the most reliable ways to induce metabolic syndrome (and heart disease) is to disrupt the HPA-axis, be it by abusing cocaine, aquiring Cushing's disease, getting depressed, using corticosteroids or damaging your spine. My dentist told me that some people suddenly develop severe periodontitis in times of grave psychosocial stress. Art Very interesting! Do you think it is possible that gluten induced leaky gut might induce antibody production against these regulatory T cells? I think that the spectrum of gluten induced disease is huge. The obsession by the medical establishment on the GI disorder (celiac), which I feel is only one manifestation of gluten induced disease, has delayed investigation of the whole spectrum. I live in Columbia Mo. Are you a Tiger football fan? How about damage to the vagus nerve from hyperglycemia? Would that suffice instead of a cut vagus nerve? or a spina bifida occulta? I know little about the brain/body interactions associated with inflammation, but it must boil down to neurons carrying an action potential to a synapse and releasing neurotransmitters that are subsequently detected by post synaptic cells with corresponding receptors. Those responding cells produce the cytokines that determine the consequences of the nerve stimulation. In the case of the vagus, the consequence can be anti-inflammatory, but if the responding cells are altered, the result could also be inflammatory, e.g. rosacea, chemical sensitivity? Much of the healing process may involve altering the status of the responding cells to permit healing. I never got into U Missouri sports. I am just an academic vagabond. I think that celiac and IBD are just extreme examples of dominating involvement of gut-trained lymphocytes influenced by both the gut environment and nerve stimulation. Lymphocytes injected into the blood stream of a mouse move to the intestines, are reprogramed and relocate to new sources of inflammation in the body. Unfortunately, in cases of chronic gut inflammation, perhaps influenced by gut biofilms, the lymphocytes emerging from the gut are insufficiently anti-inflammatory and fail to regulate to produce tolerance. The first result is allergy, then autoimmunity and degenerative disease. I think that hyperglycemia provides many types of damage and one of them seems to be destruction of peripheral nerves. The vagus may be involved and the result would be an increase in chronic inflammation, which is observed. Part of the more subtle effect of hyperglycemia would be a loss of immunological tolerance and the observed increase in degenerative diseases. I don't know much about spina bifida, but there would appear to be nerve/body/inflammation interactions both in the development of sb and in the consequences of sb, e.g. latex allergy. Maybe you could flesh out the relationships that you see. Out of curiosity, I looked up the latex allergen to see if it had the triplet of basic amino acids that I associate with all allergens. Interestingly, the allergen from latex lacks the characteristic triplet, but there are at least two related proteins in rice that have either a basic triplet or quartet. One of those is called a "latex allergen." So, I think what happens is that infants with spina bifida may be recognized to be at risk for latex allergies, but they are still exposed to rice and the strong rice allergen is the source of allergy development that responds to the similar protein allergen in latex. Reflex and the Longevity Maneuver. I have run across many gum disease references as parallels to gut biofilms, but failed to make the connection to the vagus. The links will be a lot of fun. I hope that other readers notice how important these suggestions are for inflammation treatment. I expect that some types of inflammation, e.g. rosacea, that respond paradoxically to menthol and castor oil topical applications, would also respond by inflammation to vagus stimulations. Thanks again for your insights and keep in touch. I am interested in Bernstein's statement that nerve damage can be reversed by maintaining normal blood sugars, approximately 83, for a very long period of time. He references diabetic patients who have seen improvements in gastroparesis and erectile dysfunction. He tests all his patients for autonomic dysfunction. I was trying to ask if a spina bifida occulta would be a coincidental finding or would it create a susceptibility to gluten issues. Would it have any bearing on ED? If I understand what you are saying, it would, but can possibly be alleviated by combatting the inflammation. This may require more than what Bernstein recommends. Thank you for a very informative and helpful blog. Thank you very much for the links and for sharing this interesting experience! Nigel, you stirred things up ;-). A friend of mine had severe tartar (flakes coming off his teeth just weeks after a clean up) and periodontitis. I advised him to go wheat free, because of a possible influence of gluten/WGA on K2 in saliva and gluten’s myriads of possible effects on immunity. Sure enough, six months later almost nil tartar and a marked reduction of periodontitis. A very happy n=1 experiment and I thought we were controlling our variables. We weren’t. I also mindlessly advised this guy to take cold showers as much as he can, because he has an anxiety problem (everything seems to be related). I found out some years ago that cold showers help me to relax. I never realised that he has been giving himself a powerful vagal stimulation every now and then, which could be responsible for the favourable periodontal change ;-). I wonder if he is willing to include gluten again... or to stop taking cold showers. Another thought; someone mentioned oil pulling here, which had a positive effect on his mouth health. I have no idea, but could it be that holding a fluid in your mouth elicits a vagal stimulus...? I was off on the wrong track. I keep thinking of these vagus cutting experiments as being artificial and you and others have pointed out that nerve damage could compromise the vagus based effects on anti-inflammation. My current prejudices lead to the conclusion that many of the intolerance conditions, e.g. allergy, autoimmunity, develop from inflammation plus localized injury/infection. Compromise of the vagus (SBO) could provide the same impetus as chronic, diet-based inflammation. Of course, diabetes provides ongoing inflammation, unless glucose is rigorously controlled with a low carb diet. Oil pulling would also position the tongue and require nose only breathing. It is interesting that it must be prolonged and sufficiently vigorous to make an emulsion. I wonder if the ice-on-the-face diving maneuver for vagal stimulation could be duplicated by menthol/Vicks. This could be part of the impact of menthol in cigarettes or the Vicks inhalers. What happens with rosaceans with vagal stimulation? And this brings up questions of meditation on the immune system... to what degree can we facilitate healthy vagal tone? I think that it is obvious that meditation, yoga and many traditional remedies are effective. The only question for me is the molecular details of how they work. As you point out, the Longevity Maneuver is very similar to aspects of meditation and yoga relaxation. The question is how yoga affects biofilms. This suggests that secretions from the gums can eliminate biofilms. Is it defensins or proteases or glycanases? "What happens with rosaceans with vagal stimulation?" I haven't tried the diving reflex, but I can say that usually my face turns red and is covered by lots of papulae which are normally invisible ... I love tabasco and wasabi, and I've had to stop having them because of teh redness. I hate having contradictory conditions: get some sun, it's good for MS! Run away from the sun, or dare to become the human paella! "[...] The study by Luyer and colleagues shows that fat-induced CCK can also dampen inflammation in the gut, as rats fed a high-fat diet were protected against lethal bacteria-induced shock whereas those fed a low-fat diet were not. CCK sent signals to the brain through the vagus nerve, the nerve that provides the electrical regulation for many internal organs, including the gut and the heart. In response to CCK, vagus nerve endings in the gut released a neurotransmitter called acetylcholine. Acetylcholine then bound to proteins on immune cells and turned the cells off." Vagus nerve, inflammation, fatty food ... all wrapped up together in the same study. Nice! I remember a study on improving the survival of sepsis patients using large amounts of omega-3 oils introduced directly into the stomach. The paper you pointed to may provide another mechanism to block inflammation in addition to anti-inflammatory prostaglandins. The vagus-based anti-inflammatory response may be altered by the history of the gut to alter the acetylcholine receptors and cell types near the vagus nerve endings. or liquid turns on the vagus nerve. share connection. The vagus nerve, the tenth cranial, goes from the top of the head all through the body. Where there is stress, inflammation is soon to follow. Steve Mensing who developed the Longevity Manuever and Dive Reflex. the vagus nerve to reduce stress and inflamation. the dive reflex, slow deep nostril breathing, relaxation, and tongue submersion?" Rudy there's a number of other vagus nerve stimulators. Some yoga and Tai Chi manuevers are said to stimulate the vagus nerve. Oz and Roizen mention some Tai Chi vagus nerve stimulators in "You: Staying Young" Some other vagus nerve stimulators are known to medical folk who use them to reset the heartbeat and to defribulate. I'm not going to go into detail. Some of these other vagus nerve stimulators may be complicated and in a few cases dangerous. *The Valsalva Maneuver named after a 17th century physician who came up with the idea. You blow hard on your thumb. This in turns creates thoracic pressure on your Vagus nerve. Blow too hard and you can break cappilaries in your eyes. I don't recommend it when easier, better performing, and safer methods exist like the "Longevity Maneuver" and our version of the "Dive Reflex"
*A headstand. The blood flow change and downward pressure of the organs affects the vagus nerve. Many people can't perform a headstand. *Gagging with a tongue depressor is said to affect the vagus nerve. Not a good idea because you may feel very ill afterwards. *Carotid sinus massage. Dangerous because if you get it wrong you might create a stroke or stop your heart. Stick with our more gentle and safer Longevity Maneuver and our ice bag version of the Dive Reflex. Thanks for the comprehensive look at simple procedures for vagus stimulation. 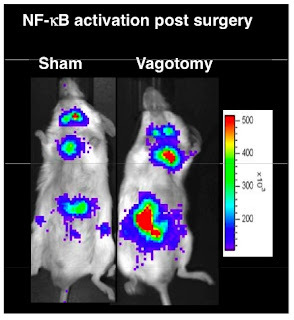 It is interesting that vagus stimulation also seems to result indirectly in inflammation, e.g. some rosaceans report flushing as they relax approaching sleep. prior to sleep raises my curiosity. On attempting to discover more about this flushing phenomena I visited a number of rosacea websites, google books, and message boards. On all of them relaxation and stress reduction were recommended for rosacea. But that still didn't answer question why some some persons with this skin malady get flushed when relaxing before going to sleep. varible in the body or neurological system that triggers this presleep inflammatory response. I agree that the connection of inflammation to the CNS leads to psychosomatic complexity. But, based on the observations of individual rosaceans and the inflammatory response to vagus stimulation, it seems possible that the vagus stimulation coming from relaxation may lead to flushing inflammation. What is the physiology behind vagus stimulation that produces vasodilation via NO or prostaglandins? In non-rosaceans, the same vagus stimulation is anti-inflammatory and apparently involves Tregs. Is it differences in the cells that are listening to the acetylcholine of the vagus, or in this case trigeminal efferents? It seems to me that the flushing pattern follows nerve mapping to the face, not vascular. This is a complex confluence of immunity, neurobiology and inflammation. I have rosacea with severe flushing. Prior to commencing high doses of D3 five and a half months ago, all my symptoms were severe.I was very vitamin D deficient, common among rosaceans. Prior to commencing D3 going to bed was a nightmare as it would trigger terrible flushing, particularly nose flushing. One has to consider the possible factors involved. Firstly, a change of position. Laying down was impossible, so I would sleep elevated on three pillows. This reduced the flushing trigger, but it would still occur. A change of blood pressure in the face was to be taken into consideration. However, the same thing happened when dozing in the chair in the afternoons. I had felt fatigued for some years and upon commencing D3, this exacerbated all sypmptoms. It was like having the flu in addition to inferno face. It was so nice relaxing in the couch, but just as I would be about to nod off, WHOOSH!! Every time! Do I have a busy mind? Well yes, it is generally full of important thoughts, but not when I want to relax. I am simply switch off. Flushing also occurs during the night and upon stepping out of bed in the mornings. Actually the mornings are my worse time right now. I also flush with talking, eating and breathing. It is hard to eliminate the latter, although it would certainly put a stop to the rosacea! Previously, with each breath I took onlookers could observe a wave of blood passing over my face. I could feel it too. You might suggest I suffer from society anxiety if I speak, but that is not the case. I will flush if I talk to myself as well. Merely opening my mouth will cause a wave of redness to pass over my face. If I open my mouth wide to examine back teeth, this will result in an engorged face. Doing a headstand would make my face explode. Deep breathing, sitting cross legged on the floor doing yoga etc, all produce a redder face. My enjoyment of a good movie, or reading a book, can also trigger flushing, particulary in the evening. Body clock flushing. As can any form of concentration of long duration. Sitting at the computer is a major trigger. It is like the blood pools in my skin causing pressure, heat then flushing. I should note, I am an extreme case, although there is a sub group of rosaceans who share some of my symptoms. I also flush for no obvious reason. I react terribly to fish oil, garlic, spices, voltaren and a list of other anti inflammatories. The list of foods I react to is too long to note here. Stress is a major trigger for most of us. I am completely heat intolerant. Wind back the clock before I became a severe case, laying back on the pillow and having a nice nap would relieve all the pressure and mild redness in my face. I would look very pale. Same disease, but perhaps reactions depend on the severity. Or as Dr Ayers has suggested to me, it might depend on how entrenched in multiple systems the disease has become. High doses of Vitamin D3 has improved my condition immensely, but it is one hell of a rocky ride. There is a theory you might find interesting. Crypic bacteria in the tissues are at play and any attempt to reduce inflammation increases pathogen load. Vitamin D is fighting the battle. I control my flushing with intermittent application of gel ice packs ( covered to avoid freezer burn) and the frequent sucking on ice cubes. I have to undertake the latter lying in bed as I am approaching sleep. I feel this has less to do with vagal stimulation and more to do with vasoconstriction. It should be remembered many rosaceans, including myself have excessive vasculature. Sorry about the long rambling post. My aim was to provide clues, if they exist? Thank your for your stimulating coments. the mineral boron. The body flareup sounds like a herxheimer reaction where all bodily symptoms suddenly worsen before getting better. Hopefully the day will come when persons with inflammatory skin difficulties find a way out. Check out this study on post workout parasympathetic nervous system stimulation using cold water on the face. Can you explain the mechanism of how Menthol/Peppermint is anti-inflammatory? Menthol binds to the cold sensing receptor in the same way that hot pepper capsaicin and castor oil ricinoleate bind to the hot sensing receptor. Both classes of receptors send signals to the spinal cord and return signals release acetylcholine that stimulates cells of the immune system to produce anti-inflammatory cytokines. These cytokines reduce inflammation and relieve pain. Hence, application of menthol to your wrist can reduce pain and inflammation from a burn on your fingers. I think it is imperative to experiment new medical theories before implementing them, but I think it's so mean to do that to lab rats. They also feel as us, but what can we do for them? I've been reading your archived posts and comment conversations with interest. My husband has Crohn's with strictures as the only symptom. He had his vagas nerve cut in an early stomach ulcer surgery in the late 70's (He has 1/2 stomach left). What effect could this have on his inflammation/stricturing issues? Would vagal stimmulation have any effect? (Beside relaxation). We are looking into testing for Klebsiella also. I am an anti-inflammation diet delver. I'm very interested in tradtional diets and food prep methods. I brine meats to break down proteins, sourdough culture low gluten splets flour, brew a raw goat milk kefir daily and make pickles and sour kraut from our own garden which is remineralized, organically nurtured soils - getting mycobacterium vaccae as a bonus as well as other good soil microbes. We green juice and eat grass-fed meats. But, still having Crohn's stenosis. I'm interested in K2 or serrapeptase to maybe digest the stricture, but he may be sensitive to Aspergillus in natto culture. Sorry to ramble. Thought you might have ideas. Thanks for all your research and passion. How about the blood: sed rate and C-reactive Protein. Anybody looking at these? Reason I'm asking is my sed rate has been over 100 for 3 years, CRP is normal. Doctors don't know what to make of it. I've practiced the Eiriu Eolas pipe breathing (vagus nerve stimulation) technique faithfully for 3 months and it had now affect. What can be done for a vagel nerve problem. I have atypical Larygopharyngeal Reflux. PPIs didn't work for me, I came out of a fundoplication 10x worse. Vit D and omega 3 and helped alot and not eating meat, chicken, pork, lunch meat and the usual things has helped. What else can be done to repair the vegal nerve? Ah hah, I've finally found the answer to the vagus nerve stimulation for stress and inflammation question. I knew the answer must be on your blog somewhere. So, yes, stress psychosocial stress, poor sleep, etc, do cause inflammation and it is important to address those as well. It's difficult these days to keep up with the literature. I consider myself knowledgable about inflammation but I just came across the work of Dr Kevin Tracey several months ago about the "Cholonergic Anti-Inflammatory Pathway". I've tried to summarize it here. It's a must read Dr. Ayers. mantra for the vagus nerve is om!